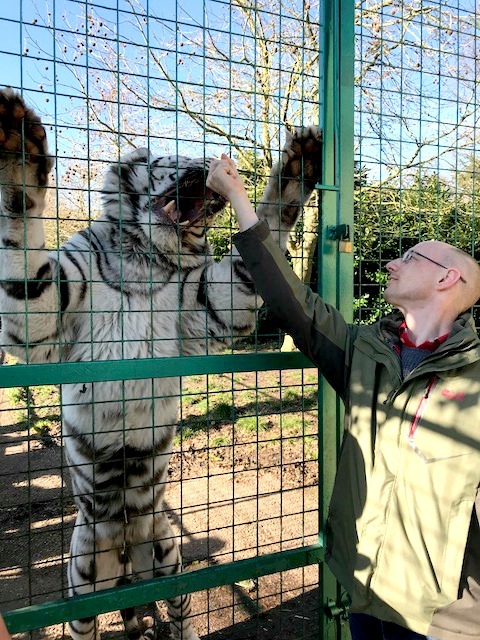 I will openly admit that feeding a tiger was not on my bucket list. I have only just managed (at the age of 41) to stroke my friends cocker spaniel! My husband on the other hand loves animals, so when Paradise Wildlife Park asked if he would like to review the feed a big cat experience for his 40th Birthday, I lept at the chance. Infact I was excited to be taking part too. I mean the tiger is behind a metal fence, how scary could it be? We headed to the park nice and early and reported to the discovery centre. They stamped our hands and let us go into the park for a quick look around. We headed back to the discovery centre 10 mins before our feeding slot and had a hot chocolate and biscuit whilst we signed our waiver. We then met Ian who was our guide for the experience. 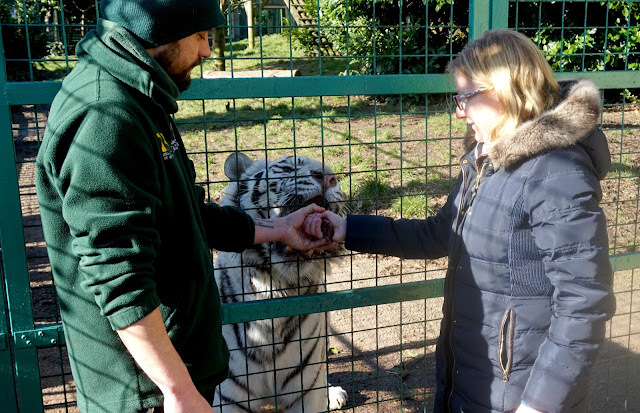 I was expecting to be told which big cats we were feeding, but he advised we could choose. Obviously our chosen cat may not be in the mood and if so we would then need to move to another. So now came a big decision. For me it was between the lions or white tiger. The keeper had explained that the other tigers were mourning the loss of their male a few weeks previously, so we felt we would leave to grieve in peace. Having been and enjoyed tea with a tiger with Red Letter Days, I already had a soft spot for the white tiger. My husband was happy and we opted for this. On the walk over, Ian told us all about Baikal. He had come from a zoo in France when he was young. 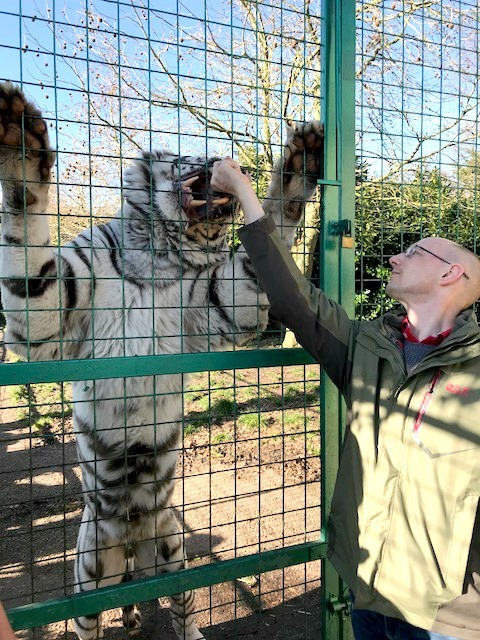 They had tried to put another white tiger who had been rescued from a circus with him, but being solitary animals they didn't get on.The other tiger is at their sister site in Kent. Ian explained that they would not breed Baikal as that would be irresponsible. 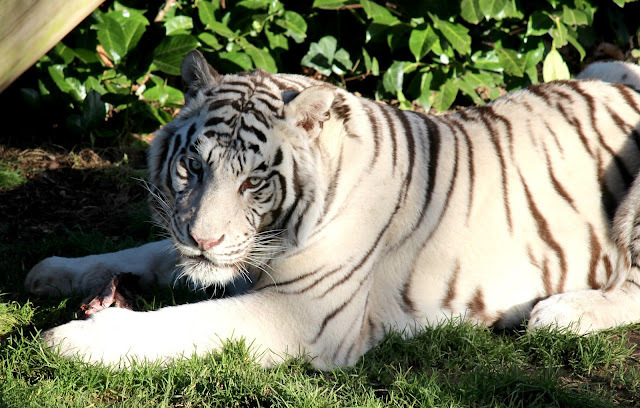 White Bengal Tigers are genetically inferior due to inbreeding and can't survive in the wild. He therefore said that he felt the park was the best place for Baikal. We arrived at the enclose and Ian went through how to hold the meat and present it to Baikal. As we were a couple, we both had 5 pieces of meat to feed Baikal.. If you do the experience by yourself you will have 8 pieces. Ian advised that if we got licked it would feel like sandpaper. Was I scared? Not at all. My husband went first. His face lit up when he fed the tiger. After a couple of low down feeds, Ian advised to raise his arm so that we could see him in all his beauty. I chucked when my husband exclaimed he was a big cat. Of course he was! Was I scared? Not at all. 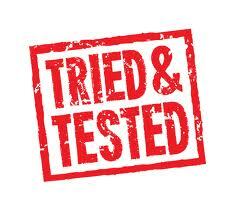 Then it was my go. I calmly walked to to the fence. My husband was right, he was big! Ian placed the meat in my hand. I went to put my hand against the fence. Baikal opened his mouth. Was I scared? No, I was terrified! I pulled away and couldn't do it! This is when Ian was fantastic. He didn't make me feel stupid. He asked if I wanted help. I accepted. He put his hand over mine to give me assurance. It is amazing how being a few feet nearer makes something more scary. It is only this close up that you really appreciate the shear size of a tiger. The long slightly curved and sharp teeth, The mouth opened so wide. His massive claws which would knock you down with one blow. My imagination ran wild, but he really was the most gentle of giants. Whilst absolutely terrified I managed to feed him by myself. He carefully took his chunk of meat and swallowed it whole. It was, without doubt, one of the best experiences I have ever had. Maybe it was because I wasn't expecting it to be scary. Maybe it was because it was something I wouldn't normally choose to do. Maybe it was because it really is a special thing, being able to feed such a beautiful and powerful animal. I had wanted my husband to have a 40th he would remember and with an experience like this my wish was delivered. If you want to see us both in action, then I have made a short video. Complete with my cackles of relief! As part of the experience, you can spend the rest of the day in the park (which deserves its own post very soon) and a goody bag that has a certificate and magnet in. If you are looking for a present for the person that has everything then I can guarantee this is a day that they will remember forever. A massive thank you to Paradise Wildlife Park for such an amazing day. Yes you do Fiona! It wasn't until I was up close that I realised how HUGE he was. He was massive - I felt so small! Such a beautiful and very large animal!